Sometimes you need chocolate. 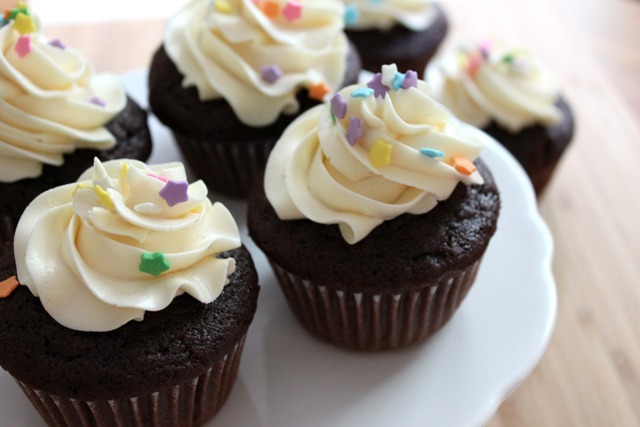 And what a better way to get your chocolate fix comes in the form of a cupcake! I’m always on the hunt for a great chocolate cupcake recipe…sometimes to get that chocolate fix and other times just to have the perfect recipe up my sleeve in the event one of those cravings emerge. And I’m happy to say that for now, my hunt has ended. I saw Annie post this chocolate cupcake recipe a few weeks back as part of some decadent triple chocolate cupcakes and I was enamored with the perfect amount of puffiness these cupcakes had in her photo. I should have known they would be a great recipe though, since it is a Martha Stewart recipe and Annie tends to have some pretty great instincts when it comes to great cupcake recipes. All in all, both the cupcakes and the Swiss meringue buttercream had some fantastic reviews from my co-workers and I totally loved them. The cupcakes were moist and chocolaty and the buttercream was velvety smooth, dreamy and can best be described as some of the best frosting I’ve ever tasted. While the buttercream is a little more labor-intensive than my usual Wilton recipe, the results are much more satisfying and I can honestly say that this will be a mainstay in my repertoire. 1. Find a good recipe…like this one! 2. Don’t fiddle with the pans while the cupcakes bake. If possible, don’t rotate the pans until the cupcakes are almost fully set. 3. Ensure the cupcakes are fully baked through (use a toothpick!). Preheat the oven to 350˚ F. Line standard cupcake pans with paper liners. In a small bowl, whisk together the cocoa powder and hot water until smooth. In a medium bowl, whisk together the flour, baking soda, baking powder, and salt; set aside. In a medium saucepan, combine the butter and the sugar over medium heat. Heat, stirring occasionally to combine, until the butter is melted. Remove the mixture from the heat and transfer to the bowl of an electric mixer fitted with a paddle attachment. Beat on medium-low speed, 4-5 minutes, until the mixture is cooled. Mix in the eggs, one at a time, scraping down the sides of the bowl as needed and beating well after each addition. Mix in the vanilla and then the cocoa mixture and beat until incorporated. With the mixer on low speed add in the dry ingredients in two batches, alternating with the sour cream, beating just until combined. Combine the egg whites, sugar and salt in a heatproof bowl set over a pot of simmering water. Heat, whisking frequently, until the mixture reaches 160° F and the sugar has dissolved. To tint buttercream (or royal icing), reserve some for toning down the color, if necessary. Add gel-paste food color, a drop at a time (or use the toothpick or skewer to add food color a dab at a time) to the remaining buttercream. You can use a single shade of food color or experiment by mixing two or more. Blend after each addition with the mixer (use a paddle attachment) or a flexible spatula, until desired shade is achieved. Avoid adding too much food color too soon, as the hue will intensify with continued stirring; if necessary, you can tone down the shade by mixing in some reserved untinted buttercream. This frosting! Light and fluffy and… light. And fluffy. I was amazed when it started coming together. I am not very handy with a candy thermometer and usually mess up any recipe calling for a specific temperature. But this was so easy and perfect. I added lemon oil and pink gel coloring and frosted pink lemonade cupcakes. I can’t wait to try adding other flavors.